Built in 1931 and opened in 1932, the historic Pasadena Civic Auditorium is one of the most revered performance halls in the nation. The Civic has played host to Broadway musicals, world class ballet, symphony orchestras and celebrity speakers as well as the Prime Time Emmy Awards, and the People's Choice Awards. The main floor of the Pasadena Civic has 1,922 fixed seats with 98 installable orchestra pit seats. The loge seats 560, the upper balcony seats 449 for a total capacity of 3,029. Located on the second floor, the classic Gold Room provides an unforgettable setting for smaller meetings, receptions, or dinner parties of up to 300 guests. In February, 1932, during the lowest ebb of the Great Depression, the new Pasadena Civic Auditorium was dedicated "to the citizens of Pasadena, whose efforts and sacrifices have made the erection of this beautiful and useful building possible." In the decades since its dedication, the Civic has hosted millions of patrons from several generations of Southern Californians. The Civic has been the center of Pasadena's Cultural life by hosting thousands of community events such as Rose Queen Ceremonies, graduations, benefit concerts, speeches by famous personalities, and countless programs for children. The live radio broadcasts of the big band dances from the Civic in the 1940s helped to spread the fame of Pasadena across the United States. With the construction of the Pasadena Center in the 1970s, the Civic became part of a full service convention center that includes a Conference building, Exhibition building, and a hotel and parking garage. A home for ballet, symphony, popular music, musical comedy and television programs, the Civic is known for a wide variety of special events. Among the many great orchestras of the world, the Civic has hosted the New York Philharmonic, the London Philharmonic, the Los Angeles Philharmonic, and is the home to The Pasadena Symphony. The house is very well suited to ballet. The Civic has hosted the dance program for the 1984 Olympic Arts Festival as well as repeating engagements of the American Ballet theatre, Dance Theatre of Harlem, and the San Francisco Ballet. The list of performers who have graced this stage is an overview of the great performers of the twentieth century. 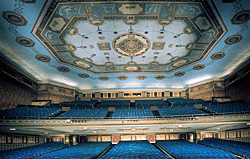 Diverse artists such as Marian Anderson, Victor Borge, Eric Clapton, David Copperfield, Bob Dylan, Ella Fitzgerald, Josh Groban, Hal Holbrook, Bob Hope, Luciano Pavarotti, Arthur Rubenstein, Carlos Santana, and Stevie Wonder have performed at the Civic. A favorite location for television and film, the Civic hosted the Prime Time Emmy awards for more than twenty years. The theater is particularly well known for its TV specials such as Ray Charles 50 Years in Music and the Motown 25th Anniversary Television Special. In recent years, the Civic has become a regular stop on the Broadway touring circuit with such productions as Cats, Les Miserables, Riverdance, Beauty and the Beast, and Evita. The Civic is a grand theatre with a varied and proud tradition. It will serve us well into the 21st century.